Over the last few months Google Analytics has introduced new Audience reports. The new audience reports map your custom audiences (those you have created under audience definitions) to acquisition, behavioural and conversion metrics. This is a great update as we can now see how each audience performs cross channel. Previously we needed to create custom reports or segments to achieve this so it’s great to see an easier option from the Google analytics team. 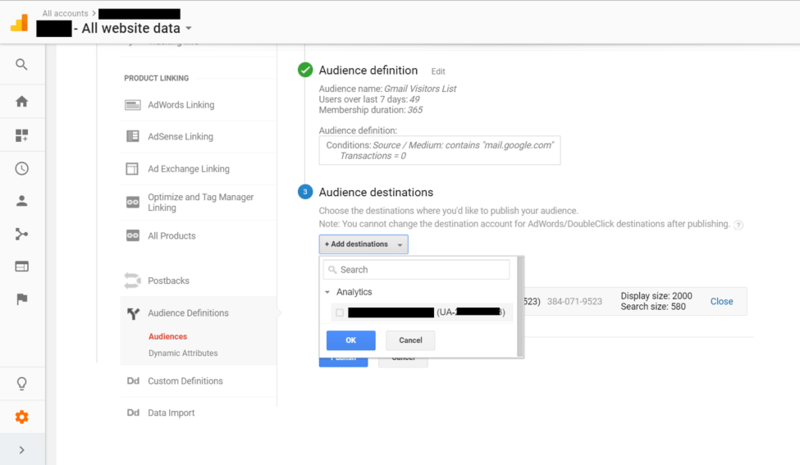 To get started with this new Audience feature you need to have audiences set up in Google Analytics. I assume you all know how to do this. The next step is adding Google Analytics as an audience destination. If you have older audiences set up you can still add Google Analytics as a destistination. What this step does is add the audiences you want to the audience report. Once completed you can then go to the audience report itself. As you may know, Google doesn’t publish historical data so you will find that the reports are empty when you initially create them and they’ll accrue data with time. You can now add secondary dimensions or use any other techniques to analyse your audience performance. I am yet to see the Audience dimension in custom reports but I can safely assume it will be coming soon.